What happens when businesses and their customers don’t share the same values? Or, for that matter, when employees of a company don’t share the same values as their executives? Companies no longer have a choice. If the gap between a business and its values and its customers or society and his other stakeholders is too large, business will inevitably suffer. How do brands align their values with the values of their customers, their employees, and society at large? What is needed, now more than ever, is a mindset that views reality from the outside in. Brand Activism consists of business efforts to promote, impede, or direct social, political, economic, and/or environmental reform or stasis with the desire to promote or impede improvements in society. This brand activism is a natural evolution beyond the values-driven Corporate Social Responsibility (CSR) and Environmental, Social and Governance (ESG) programs that are, frankly, too slow. 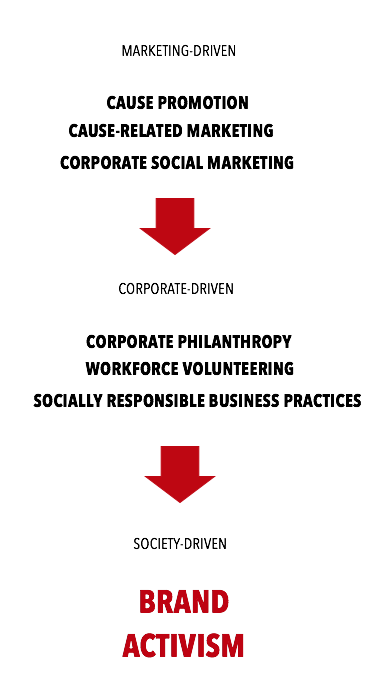 In Corporate Social Responsibility: Doing the Most Good for Your Company and Your Cause (2005), Nancy Lee and Philip Kotler identified six major areas for corporate social-responsibility activities. They were marketing-driven or corporate-driven – based on what it means to be a good corporate citizen. Brand activism is different because it is driven by a fundamental concern for the biggest and most urgent problems facing society. It gives life to what it means to be a “values-driven” company. You can’t be a values-driven company and disregard society – your employees, your customers, the communities you work in, and the world. The proof is in what you do, not what you say. A warning: we should be clear in saying that activism doesn’t have to be progressive; it can be regressive as well. The poster-child for regressive activism is Big Tobacco – the tobacco companies that for so many years denied the harm their products did to consumers, even when their own research revealed otherwise. They promoted the “virtues” of smoking in a way that actually hurt consumers. Companies that lobby our politicians for regressive policies are regressive brand activists. On the progressive activism side, we see more and more companies seeking to have an impact on the biggest societal problems. These companies have a larger purpose than simple profit-seeking, and are increasingly seen as leaders in their industries. 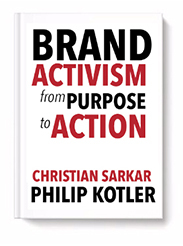 That’s what our book, Brand Activism: From Purpose to Action is about.